Consider these: Indian Oil Corporation, the state-owned oil marketing company, has around 9,000 cases pending in various courts across the country - bulk of them being five to 10 years old. "An estimated Rs 5,000-Rs 10,000 crore is stuck in these cases that include tax and commercial disputes," says Deepak Dhawan, executive director (legal), Indian Oil Corporation. There are around 30 million pending cases across the judicial system. Around 400 positions of judge in the Supreme Court and various high courts are waiting to be filled up. 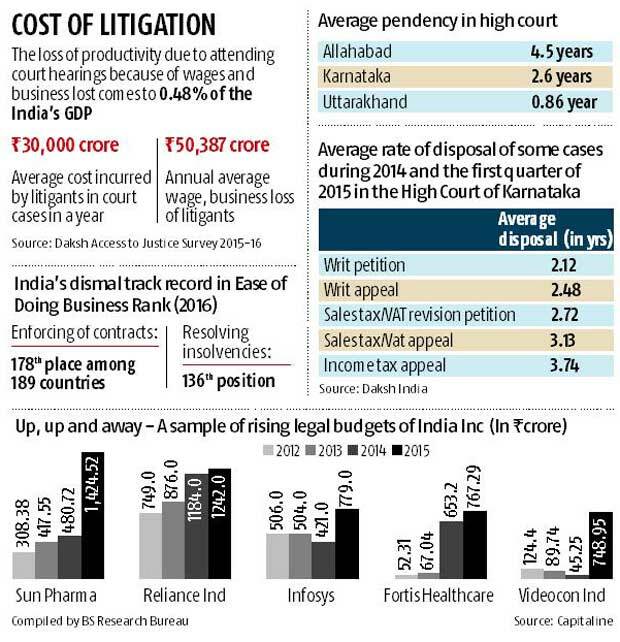 According to the 253rd Law Commission report, submitted in January last year, of the total 32,656 civil suits pending in the five high courts with original jurisdiction, a little more than half (16,884) or 51.7 per cent are commercial disputes. This is also reflected in India's dismal track record in Ease of Doing Business Rank (2016) - the country is placed at the 178th position (among 189 countries) when it comes to enforcing of contracts. In resolving insolvencies, India is at the 136th place. When quizzed on the impact of high pendency rate of cases in country's courts, the India legal head of a US-headquartered multinational manufacturing company is quick to point out that "litigation related to tax and intellectual property protection is among the biggest concerns from an MNC perspective." A corporate lawyer, closely involved with cross-border M&A deals, concedes that most foreign clients consider getting entangled in the judicial system as "big" business risk while investing in India. Most large corporate houses have seen sizable jump in their annual legal budget over the last four-five years. For instance, Sun Pharma's annual legal budget ballooned almost five times - from Rs 308 crore in 2012 to Rs 1,424 crore in 2015. The legal expense of Reliance Industries has nearly doubled between 2012 (Rs 749 crore) and 2015 (Rs 1,242 crore). Both the executive and the judiciary - despite mutual differences - realise that desperate times call for desperate measures. To cut the long shadow of pendency of cases across the judicial system, there is a move to re-appoint retired judges on an ad hoc basis in high courts. The government is also in the process of expediting the appointment process of judges. Legislative measures - such as setting up of new commercial courts in various states, or amendments to the Arbitration and Conciliation Act, 1996 - are expected to infuse fresh blood into the overstretched judicial infrastructure. However, legal experts and corporate counsels say these measures are only expected to show results over the next two to three years. "We need fast-track courts to clear commercial disputes, along with special benches to tackle taxation disputes," says Alok Prasanna Kumar, senior resident fellow, Vidhi Centre for Legal Policy. Corporate lawyers and legal counsels point out to the success of the two-judge Supreme Court bench of judges A K Sekri and Rohinton Nariman that heard tax cases for almost whole of 2015. In 2015, the apex court gave out 197 judgements related to tax laws. This is almost as many as the court managed in the three years preceding 2015, notes Kumar. In 2013 and 2014, the apex court could give only 50 and 49 tax-related judgements, respectively. A look at the age of tax cases disposed of by the Supreme Court in 2015 is symptomatic of pendency malaise affecting the judicial system. Around 80 per cent of the cases were more than eight years old. The oldest case disposed of went way back to 1997. But the number of tax cases coming up before the Supreme Court has been growing over the years, point out legal experts. According to data collected by the Vidhi Centre for Legal Policy on tax cases filed in the Supreme Court in 2014 - 1,869 related to direct tax and 1,530 pertained to indirect tax. In addition, there were 646 arbitration matters, 539 related to mercantile law, commercial transactions and banking, and 327 to company law, MRTP and allied matters. Kumar points out that a special tax bench has a trickle-down effect on other pending tax litigation in different courts across the country. "They set a precedent, clarifying several points of dispute," he adds. Surya Prakash, fellow and programme director at Daksh, a not-for-profit agency working on the Rule of Law Project to study the problem of pendency of cases within the Indian legal system, says there is a need for special effort to tackle cases relating to petitions for winding up or dissolution of companies in high courts. "Company petitions seem to take the longest in most high courts. For instance, in the Karnataka High Court the average pendency is six years, though such cases make up not more than one per cent of the total workload of the high court," says Prakash. Similarly, tax cases too figure on the list of case types with the most pendency in high courts. For instance in the Karnataka High Court, tax cases on an average pend for four years. 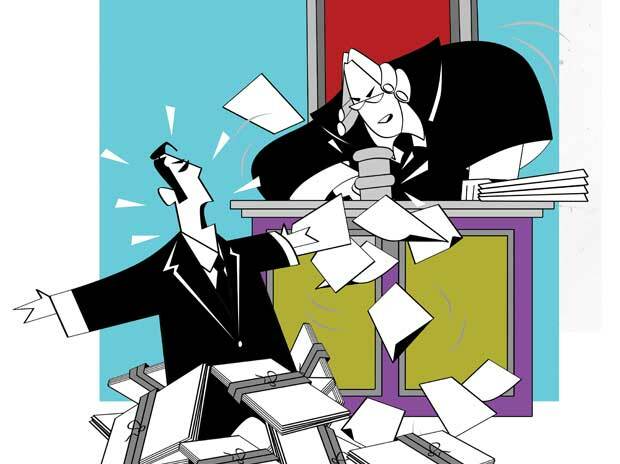 Tax cases, too, don't make up more than one per cent of the total workload of the high courts, say tax experts. The way forward, suggest corporate counsels, is to train high court judges to deal with specialised disputes, especially those relating to taxes and intellectual property rights. "Just making improvements in legislation is not sufficient. There is a need to invest in physical judicial infrastructure and appoint more judges across courts" says Dhawan. Clearly, there are miles to go on the road to curtail the shadow of pendency of cases on businesses.